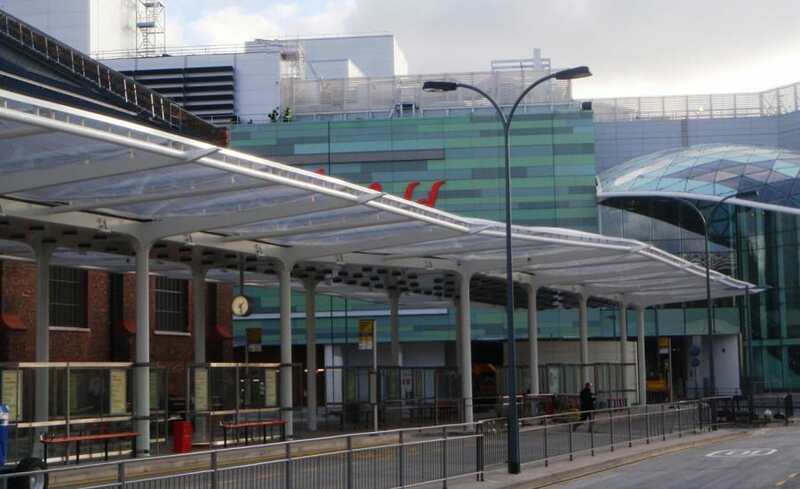 The NW Bus Interchange is an exciting project which Architen Landrell is thrilled to have added to the company portfolio. Covering almost 1200sqm, thirty seven 2 layer ETFE cushions form a winged canopy providing visitors to the Westfield White City Shopping with weather protection and a stunning architectural feature. 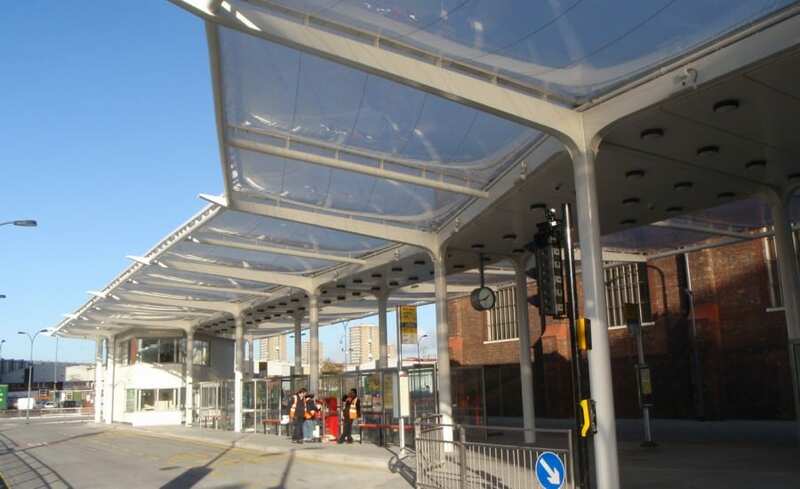 The ETFE cushions cover the 60m bus interchange and ensure maximum light is transmitted to the space below creating a light, airy and ultimately safe-feeling environment. 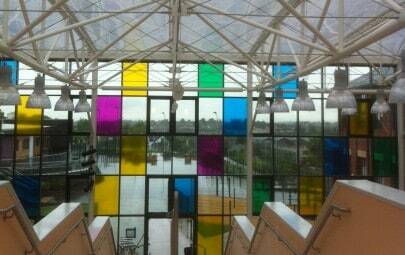 The ETFE foil, however, is not 100% transparent. The two ply cushions have a standard 40% fritting to the top layer which minimizes glare and controls solar gain but still allows plenty of natural light to permeate. The Architen Landrell team, when starting work on the interchange canopy, were presented with an existing design by the clients engineers. Although on an extremely tight time frame, the design department made some minor alterations in order for the structure to be able to work with our patented extrusion and to improve the ETFE steel interface detail. 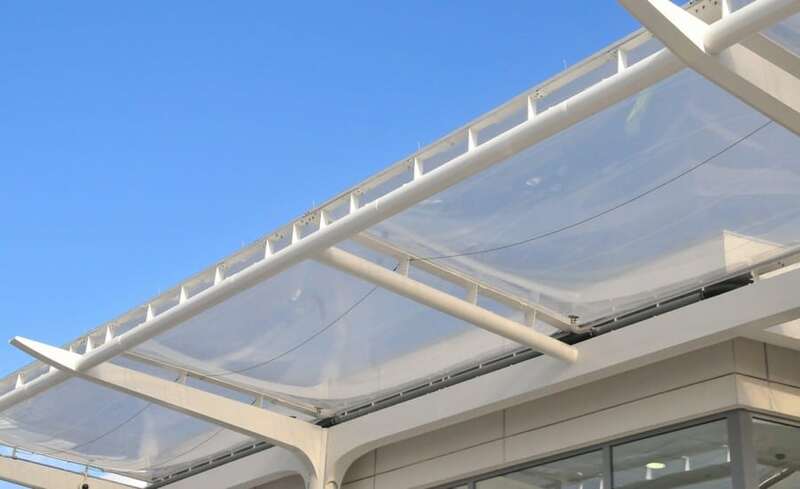 Essentially a straightforward ETFE cushion canopy, this project gave the electronics team a chance to develop and apply their in house control system. The control system monitors and adjusts all aspects of the inflation system 24/7 and includes a remote diagnostic tool so it can be accessed from anywhere in the world. Using multiple sensors located throughout the structure, it automatically monitors the external environment and adjusts the pressure of the cushions accordingly. It has an inbuilt dehumidifier which means the unit can anticipate snow by monitoring the surrounding temperature and humidity levels and reacts in view of this. The control system has been an undoubted success, however, it was the incredibly tight programme was the real challenge with this project. 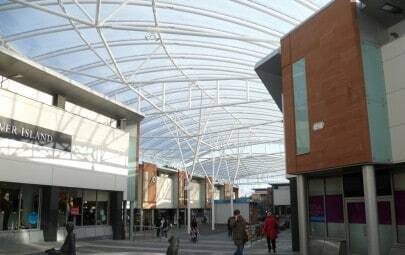 A late placement of order meant that there was only two months for fabrication drawings and manufacture of the ETFE cushions and supporting steelwork before we were on site. 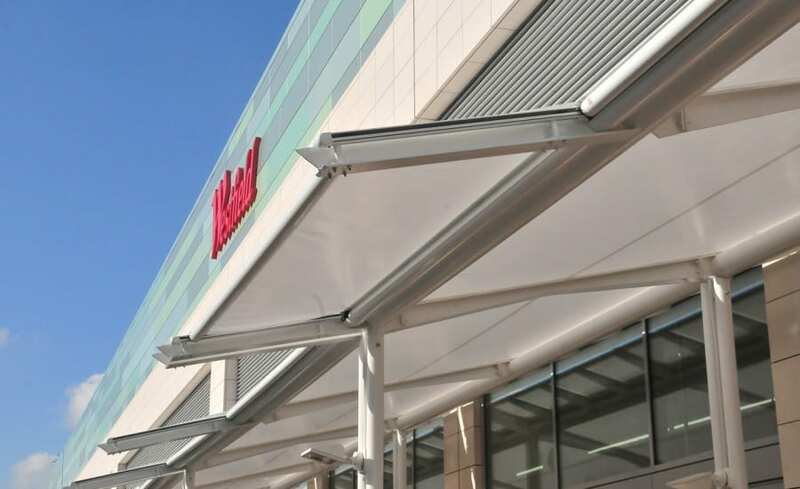 Once on site, a further two months were available for installation; however, the busy nature of the Westfield White City construction site meant that this proved a close call. Minimal time was not helped by tricky site access. 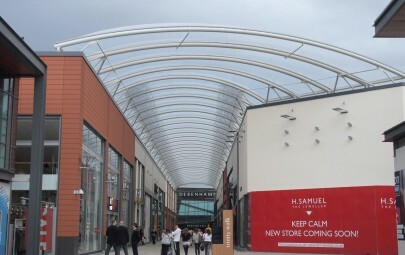 The steel and fabric had to be installed in separate visits due to the very complex access issues across the huge forty-two acre Westfield White City construction project. This was largely overcome by installing during off peak hours the installation crew worked throughout the nights to ensure that maximum progress could be achieved. Despite the time constraints and access issues, Architen Landrell successfully met all scheduled dates and completed ahead of the grand opening. 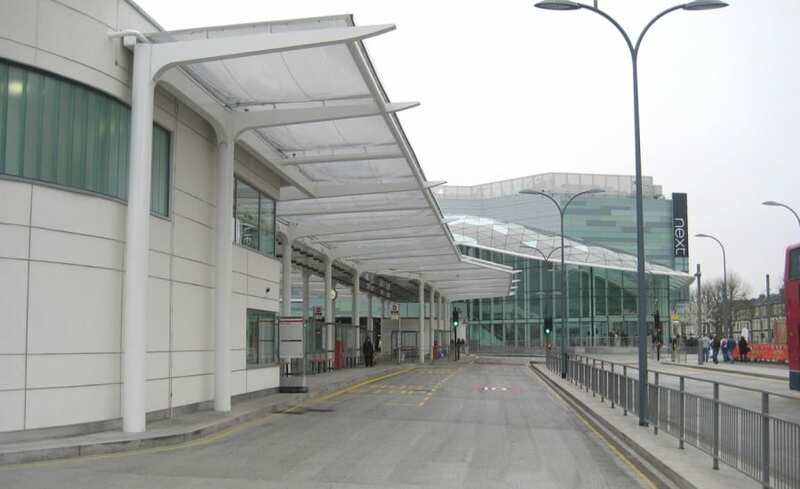 Skanska McNicholas, who worked with Architen Landrell previously on the LED lit, fabric walkway at the O2, chose us specifically because they knew that we would hit the deadlines and ensure a efficiently run project and a high quality result. Now complete, the Architen Landrell team and the client are both happy with the results. 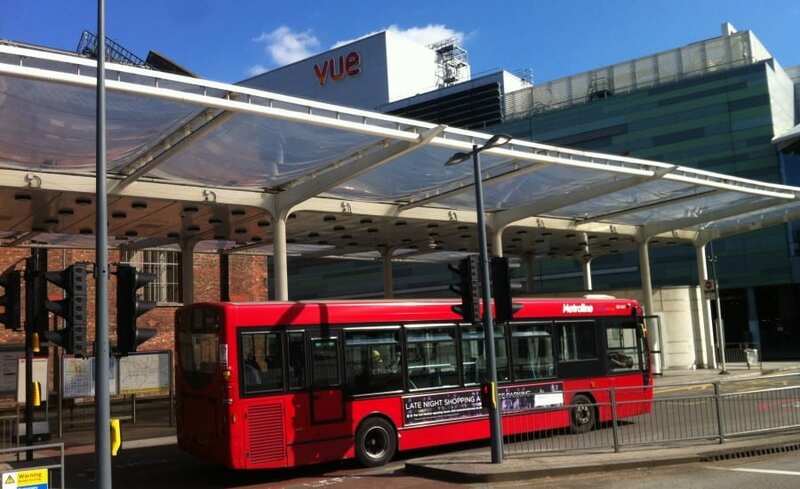 Adam Hall, Project Manager for all Westfield White City projects said The striking canopy at NW Bus Interchange is entirely due to the hard work and dedication of the team, despite site pressures and an intense timetable. Id like to say thank you to everyone whos played a part in successfully completing this project!